The high stress-crack resistance of Alkadyne® HCR193B opens up the possibility to review installation design factors for trenchless installations where they have been added to address the risk of slow crack growth failure. This may allow for fit-for-purpose risk based designs, as described under the section PE100 HSCR Alternative Tender Support, that feature pipes of lower wall thickness, provided the mechanical strength of the pipe is sufficient to withstand the forces working on the pipe during installation and service life. Such designs will lower project and operational costs by reducing pipe weight per metre and decreasing pumping costs as a result of increased hydraulic capacity. Fit for purpose-risk based design is gaining acceptance among designers and specifiers over “deemed to comply” approach. Current regulations are goal-setting rather than prescriptive like in past allowing use of fit for purpose approach supported by the risk management study to optimise design of pipe network. This approach has been outlined in National Codes such as The Australian Water industry specification WSA-01 (WSAA,2004) or APGA Code of Practice for upstream PE gathering networks. By entering the specific details about your pipeline installation project below, you can directly calculate the savings and benefits that Alkadyne® HCR193B can provide. Resistance to slow crack growth (SCG) is a key point of concern with designers of HDPE pipe systems, as it is the main determinant of pipe life. Accordingly, various specifications (e.g. AS/NZS 4130, AS/NZS 4645, and CSG CoP v4) assign arbitrarily selected design factors intended to allow for the vagaries of different installation conditions. The development of HSCR PE100 materials has enabled adjustment of these factors to accommodate the advantages gained, especially for harsh installation conditions such as pipe cracking, HDD, submarine installations, and sandless bedding. Adjustment of design factors is quantified following substantial laboratory testing of SCG resistance, as listed in the PIPA publication POP016. The technical benefits of Qenos HCR 193B complying with PIPA POP004, following research and testing, have been described in detail in the Qenos publication “Alkadyne® HCR193B Technical Guide”. In order to utilise these benefits the Design Charts provide engineers/designers with a simplified presentation that quantifies key aspects. These aspects are identified as pipe mass, carbon footprint, hydraulic capacity, allowable tensile load, and critical buckling pressure. Comparisons are made in each case against “standard” PE100, thus clearly displaying attributes that can be converted into cost savings and other benefits, such as environmental. In addition, the Design Charts are accompanied by explanatory notes, which confirm the technical basis for the advantages depicted. 1. Design factors in the calculator for water, which includes potable and irrigation water as well as domestic and industrial sewage, are based on guidance in AS/NZS 4130:2009. The installation design factor f3 as per this guidance is used for standard PE100, whilst a design factor f3 of 1.0 is used for Alkadyne® HCR193B independent of installation technique. This fit for purpose design approach is backed by the superior slow crack growth performance of Alkadyne® HCR193B. Care should be taken that the fit for purpose pipe design meets mechanical strength requirements of the installation for which guidance is provided in terms of safe pulling stress and external buckling capacity in the calculator. See for more information “PE for Horizontal Directional Drilling” https://plasticpipe.org/pdf/chapter12.pdf. Design factors for temperature f1 and location f2 are set to 1.0 in this calculator and should be reviewed independently. A fluid design factor f0 of 1.25 is used for water. 2. For gas distribution networks, design factors are based on guidance in AS/NZS 4645.3:2008. The installation design factor f2 as per this guidance is used for standard PE100, whilst a design factor f2 of 1.0 is used for Alkadyne® HCR193B independent of installation technique. Design factors for temperature f1 and population density f3 are set to 1.0 in this calculator and should be reviewed independently. A fluid design factor f0 of 2.0 is used for natural gas and 2.2 for LPG. 3. In the case of coal seam gas gathering networks, design factors are based on the APGA Code of Practice for Upstream Polyethylene Gathering Networks – CSG Industry, V4.0. The installation design factor f2 as per this guidance is used for standard PE100, extending the factor of 1.2 also to pipe cracking and slip lining, whilst a design factor f2 of 1.0 is used for Alkadyne® HCR193B independent of installation technique. The design factor for temperature f1 is set to 1.0 and should be reviewed independently. The material design factor f0 is 1.25 and the fluid design factor f3 is 1.0 for both water and gas in line with the code. 4. Carbon footprint is based on the weight of the respective pipe designs multiplied by the greenhouse warming potential (GWP) for polyethylene pipes published in environmental product declarations (EPD) from Iplex (http://www.iplex.com.au/resources/EandS/Iplex-PE-EPD-V1.2.pdf) and Vinidex (http://www.vinidex.com.au/wp-content/uploads/VIN104-EPD-Polyethylene-Pipes.pdf) established in collaboration with PIPA. An average GWP value of both declarations is used here. The EPDs take into account pipe and resin manufacture, transport, as well as installation by traditional open trench technique. This is a conservative approach as benefits of using trenchless installation techniques or bedding free installation are not taken into account. 5. Hydraulic capacity is calculated using the modified Hazen – Williams formula using a roughness coefficient for PE of 155, as published on www.vinidex.com.au. The formula thus becomes: Q = 4.03 x 10-5D2.65H0.54; in which Q = discharge (L/s), D = internal diameter (mm), and H = head loss (m/100m). Head loss and discharge are calculated using a fluid velocity of 1.0 m/s. 6. 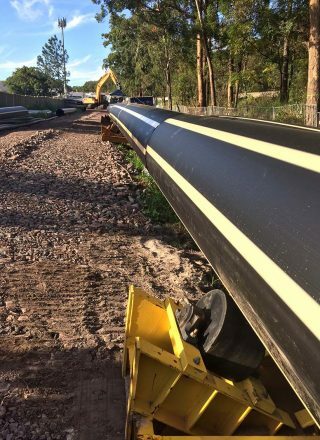 Allowable tensile load (ATL) is calculated by using the safe pulling stress as adapted for pipes compliant with AS/NZS 4130 by Bower and Steedman (Design of HDD Installations using American Design Standards and Locally Manufactured Polyethylene Pipe, No-Dig Down Under 2015, Gold Coast, Australia, 8 – 11 Sept, 2015). A tensile yield design factor of 0.4 is used and a time under tension of up to 12h is assumed at a temperature below 38°C. Tensile yield strength for both PE100B and Alkadyne® HCR193B of 21 MPa is used. 7. Critical buckling pressure at 20°C is calculated in accordance with the formula on www.vinidex.com.au: Pc = (2380*E)/(SDR – 1)3. Both a long term (50y, E = 300 MPa) and short term (3 min, E = 1100 MPa) buckling pressure is given. For the majority of cases, the short term value is applicable unless the pipe is subjected to constant external pressure after installation. Pipe out of roundedness (ovality) may have a detrimental impact on the critical buckling pressure. Please consult Qenos or your pipe manufacturer for more details.